On examination, he is appears unwell and is obviously diaphoretic. He is tachycardic (pulse 130, sinus) with a blood pressure of 148/80. He has no cardiac murmurs or pericardial rub & his chest is surprisingly clear to auscultation despite his respiratory rate of 36 per minute (SaO2 100%, room air). His temperature is normal. The distinct fruity odour of ketones wafts through the room. PMHx significant only for moderate, daily alcohol intake. BSL 7.2 mmol/L, Ketones “Hi” !! 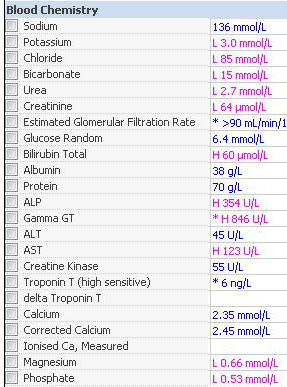 Mild alkalaemia + features consistent with a metabolic acidosis. pH 7.48, HCO3 17, BE -6. pCO2 23. 36 – ie. markedly elevated – HAGMA. 2.67 ~ HAGMA + superimposed Metabolic alkalosis or Respiratory acidosis. Interpretation – a triple acid-base disturbance. Before getting too deeply entrenched in this topic, attached are basic notes on blood-gas analysis including anion gap & other secondary calculations. This is used in the presence of a high-anion gap metabolic acidosis [HAGMA] to determine if it is truly a ‘pure’ HAGMA or if there is a coexistence of a normal-anion gap metabolic acidosis [NAGMA] or metabolic alkalosis. If one molecule of acid (HA) is added to extra-cellular fluid & dissociates, the one H+ released will react with one molecule of HCO3 (to produce CO2 + H2O). For every unit increase in an unmeasured ion (ie. anion gap increases by 1) there is a decrease in the serum bicarbonate by 1. The delta ratio quantifies the relationship between the changes in anion gap & bicarbonate. For example: if all acids were to be buffered by bicarbonate, then the increase in anion gap should equal the decrease in bicarbonate. The ratio between these two (known as the DELTA ratio) should be equal to ONE. The formula & interpretation of results. Occurs with a hyperchloraemic (normal-anion gap) acidosis. Chloride (a measured anion) contributes to metabolic acidosis (effectively HCl) creating a low strong-ion difference. The anion gap does not alter, whilst the serum bicarbonate decreases. Occurs when there is a pre-existing elevated bicarbonate prior to the development of metabolic acidosis. This typically arises from a metabolic alkalosis or compensation for a respiratory acidosis. Typical delta-ratio in pure lactic acidosis is ~ 1.6 !! Result from intracellular buffering; causing the rise in anion-gap to exceed the fall in bicarbonate. You should be treating the patient that is in front of you & not just using these numbers in isolation. The chemistry is not perfect & you should have clinical evidence to support your diagnoses. His ECG demonstrates a sinus tachycardia without features of cardiac ischaemia. His troponin was normal. 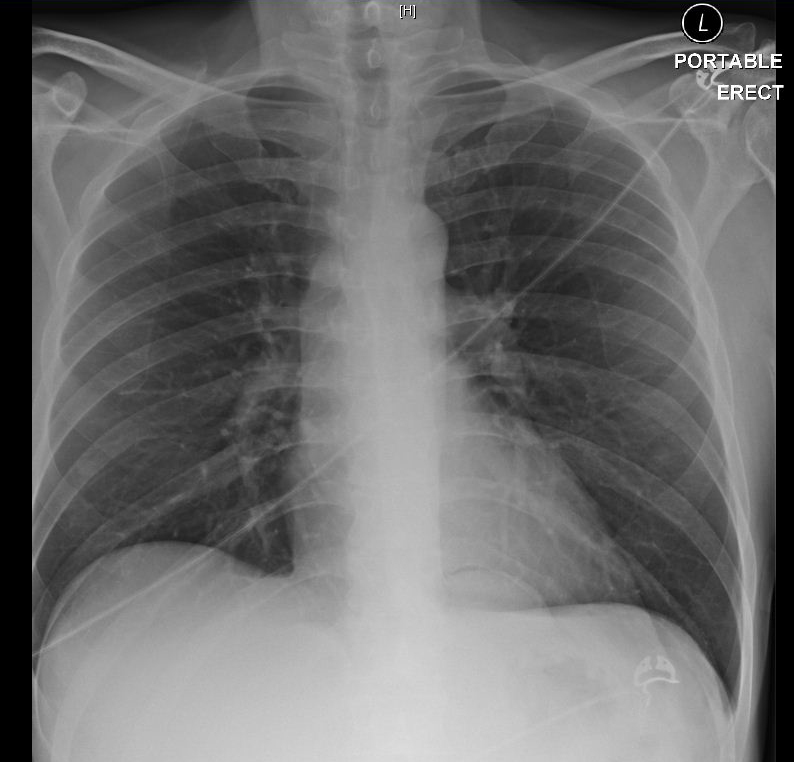 Erect CXR demonstrating clear lung fields and normal cardiac silhouette. Retrocardiac air-fluid level adjacent to thoracic spine ?hiatus hernia, however with recurrent vomiting & retrosternal chest pain the differential diagnosis of Boerhaave syndrome needs considering. What will you do next ?? With ongoing severe chest pain & an abnormal CXR, the decision is made to proceed to CT to further delineate the pathology. 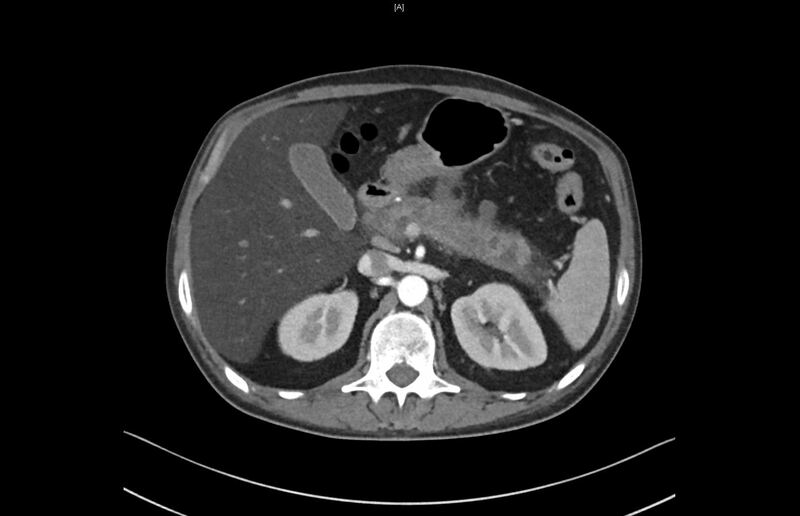 The chest component of his CT revealed a small hiatus hernia, but no features of Boerhaave syndrome or aortic pathology. 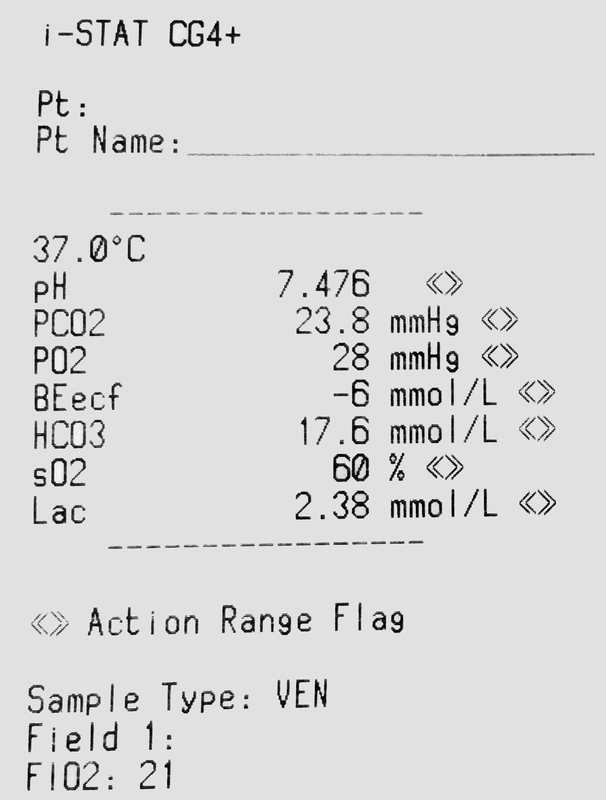 How will you manage this patient in light of this metabolic disturbance…?? He was admitted to a high-dependency bed under the care of the General Surgeons. His ultrasound failed to show evidence of persistent gallstones or biliary dilatation. His pancreatitis (?induced by alcohol) was managed conservatively & made a progressive, uneventful recovery of the next 8 days. Here are some more case-base examples to work through.